If you ever find yourself in Tokyo, I'd highly suggest fitting in a day trip to Kamakura into your itinerary! 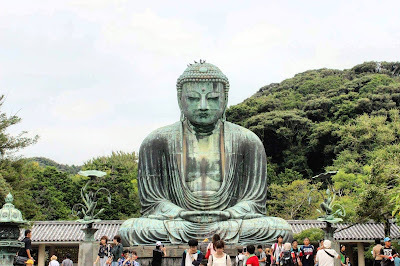 The main attraction in Kamakura is the Great Buddha, which I agree is a must-see, but there's much more to do, see, and eat after that. I would definitely recommend getting the Enoshima Kamakura Free Pass, as it makes travelling from Tokyo to Kamakura so much easier. This pass is currently 1,470 yen, valid for one calendar day, and provides you with round trip transportation from Tokyo to Fujisawa provided by Odakyu Railways. 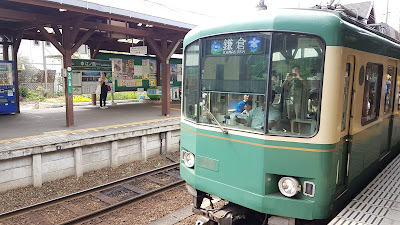 Additionally, the pass provides unlimited use of the Enoden and Odakyu Railways in the Kamakura/Enoshima free area. I bought this pass at Shinjuku Station the morning of our day trip, but you can also buy it in advance if you wish. From Shinjuku Station you will take a train to the Katase-Enoshima Station in Fujisawa. From there, you will need to walk (10 minutes) to Enoshima Station. Next, take the Enoden Line to Kamakura. You can't go to Kamakura without seeing the Great Buddha! This Buddha is a bronze station standing tall at 13.35 meters, and it is absolutely breathtaking. The Great Buddha has withstood multiple typhoons and tidal waves since being cast in 1252. Admission to the Kotokuin Temple is 200 yen, and viewing the interior of the Great Buddha is 20 yen (not much to see inside, but still cool!). Another must-see in Kamakura is Hasedera Temple, which was built to house an eleven headed wooden statue of Kannon. According to legend, the statue was set adrift at sea to find a place that it had a karmic connection with, and it washed up on Nagai Beach. The temple is very serene, and offers gorgeous views of the city from a lookout point. If you're looking for something a bit more adventurous, then I'd definitely recommend heading to one of the many hiking trails in Kamakura. My husband actually returned to Kamakura a few days after our day trip to further explore the trails! These trails offer incredible views, but they can be a bit advanced, even if the signs say that they're okay for beginners (trust me). For a smaller town, Kamakura offered a surprising number of vegan restaurants and vegan options! For lunch, my husband and I decided to stop by Kamakura 24sekki, and we are so glad that we did. The restaurant is within walking distance to the Great Buddha, but it definitely did help to have pocket wifi to help guide us. The menu was in Japanese only, but the owner helped to translate, which was a huge help. I ordered a mock-chicken sandwich, which was served on homemade bread. On our way out we also picked up some baked goods, which were also delicious. On our way home, we stopped into Harukucchii in Fujisawa for dinner, which was an absolutely wonderful culinary experience! The owner also acts as the hostess, waiter, chef, and bartender in the small & cozy restaurant. Again, the menu was only in Japanese, but Haru took the time to translate every item on the menu, and made suggestions. I ended up ordering homemade tofu, spicy edamame, a "chicken" and rice bowl, and a slice of vegan chocolate ice cream cake - incredible! 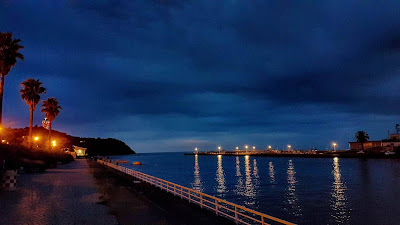 After dinner we decided to walk along Enoshima Beach just after sunset, which was quite romantic! You can walk along the pier, and even dip your toes into Sagami Bay - it's the perfect way to finish off your day before heading back to Tokyo. I'm so glad that we were able to fit a day trip to Kamakura into our Tokyo itinerary! The Enoshima Kamakura Free Pass makes the transportation aspect super easy and affordable. I loved Kamakura and Fujisawa because they're such a change of pace compared to the bright and bustling streets of Tokyo. If you're overwhelmed by Tokyo, you'll really appreciate the more peaceful vibe that Kamakura has to offer. If you've ever been to Kamakura, I'd love to hear about your top highlights and must-do's If you're planning a trip to Tokyo, I hope that I've inspired you to add Kamakura to your itinerary!